Jerry, I did not realize the meaning behind your post. I too thought it was the conception of Jesus. Norm, you made my day! First, getting to see you this morning after so long was a great way to start my day. Then, hearing that you learned something from my ramblings was an added gift. This makes the time it takes to assemble my thoughts and then get then in print all worthwhile. Thanks for taking the time to read and comment. I hope to see you this Thursday. Congratulations on your promotion! Jerry I’m sure there are a lot of Catholics who are not understanding this concept also. Do not feel you are alone. The good news is that you did make that realization and not only that, took the time to do research on it! Congratulations on working hard on knowing your faith! You are in a minority. I’m sad to say I never took the time to do any research on this. You taught me today too. I didn’t know the documentation behind this belief. Maybe I will take the time to look them up! Jennifer, thank you for taking the time to comment. I do appreciate it. It seems there are many “gospels” and other writings which say the same thing, that Joachim and Anne were Mary’s parents, and give an account of how she was conceived without sin. But, it also seems that none of these were totally consistent with the books which were inspired by God and, therefore, have been disputed. The three or four chapters of The Mystical City of God that I read which had to do with Mary’s parents and her conception were interesting. The book is actually a couple thousand pages and I didn’t take time to read the whole thing. Maybe I will some day. Like I told my friend, Norm, in my previous comment, it is always nice when something I write connects with someone else. Thank you for letting me know. I hope your vacation at Disney World has been fun. Hello to all the Robinsons. Jerry, how funny you should bring up the confusion about the Immaculate Conception just as John and I were talking about it. The lectionary doesn’t make the matter any easier since the Gospel is, in fact, NOT about the Immaculate Conception (no biblical accounts) but about the Incarnation! No wonder people are confused. Re: Sts. 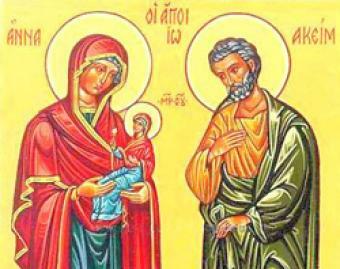 Joachim and Anne (my own patron), I’ve always regretted the dearth of information about the backgrounds not only of the members of the extended Holy Family but about people like St. John the Baptist as well. Wouldn’t you love to know what his childhood was like–when did he know he was “the one” to be the prophet of the Messiah, how did he get to be a sort of hippie-prophet? Anyway, it’s fun to make up our own stories, since we don’t have any facts. Thank you once again for your comments. Yes, it can be confusing, but I’m learning! Even considering the diference and timing of the Annunciation versus the Incarnation. I can’t tell for sure but the way I see it is the Annunciation, the angel Gabriel’s announcement to Mary that she was the one chosen by God to bear Jesus, came first, and the Incarnation, God becoming human at the moment of “conception” in Mary’s womb, came second, possibly within seconds of the first. Yes, it is fun to imagine how it would have been to have lived then and what some of the people would have been like. I like your description of John the Baptist as the “hippie-Prophet”. I think that suits him well. If you’re interested, give our friend Catherine Townsend a call and ask to borrow the “Christmas Stories” CD I gave her last year. It is by a songwriter I like, Jason Gray, and he has written some marvelous songs for Christmas from the points of view of various players in the Nativity story: the innkeeper, the shepherds, Joseph, and the wise men. The lyrics are fabulous and I like his vocal style, too. Prepare to see another post soon along these lines. We will be seeing that new granddaughter of ours this Saturday. Can’t wait! Then, over New Year’s, we plan on being present for the birth of our first grandson. Life is a changin’.